You know when you have those days where you’ll feeling creative, yet have “nothing” in the kitchen pantry to work with AND are too lazy to venture out to the store? That was exactly where I was today – until I really started digging. We are so darn spoiled here in the amazing USA. As it turned out, here’s what “nothing” looked like: I unearthed a wayward mango, 2 wayward bananas, some tropical pancake mix & rum. I had a bit of flour left at the bottom of a bag and some sugar too. Once I found fresh eggs & walnuts, that was it! I was in business. Here’s the concoction that I put together – and boy did it make GREAT MUFFINS!! 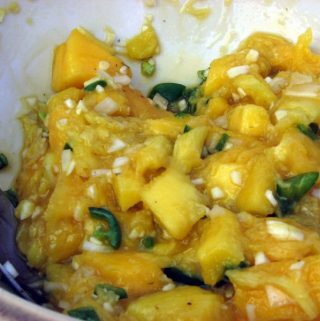 1) I pureed the mango and banana in my food processor. Truth be known, I would have much rather had 2 mangoes and 1 banana, but I was in the “use what I have” mode. Then I covered it with plastic wrap until I was ready for it. 3) Then I whisked the eggs, oil & rum (in a separate bowl). I have no idea if this is the right way, it’s just what I happened to do. Finally, I combined all together in one large bowl, then mixed just a little with my hand mixer, then folded in the nuts at the end. What came out were some really awesome, tropics infused muffins. And boy does my house smell amazing!! For those of that might want to try these little gems, the Kona mix can be purchased at Cost Plus World Market. What I seriously do feel really good about is using fruit that was headed for the compost pile in the next day or so. “Creative” gets points, but “not wasting food” gets even more points. 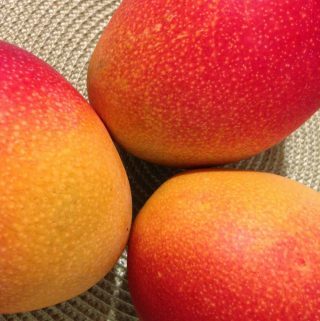 Previous Post: « Explore Mango Varieties in Pictures – What Could be Better? ?